In the wake of the recent approval of 2 CAR-T therapies, one can only marvel at the recent progresses made to harness the power of the immune system in our fight against cancer. While CAR-T therapies are certainly going to play a large role in the future, these tailor-made treatments are currently restricted to liquid cancers, require complex logistics and because they are patient-specific, their production bears a very high cost for the healthcare systems. However, while waiting for allogenic CAR-T, innovative oncologists can prevent tumor cells from escaping the immune system’s surveillance, by boosting their patients T-lymphocytes with “off-the-shelf” treatments: checkpoint inhibitors. Targeted therapies inhibit specifically (over)expressed pathways by the tumor cells or their microenvironment. They will only work for so long, as tumor cells sensitive to the drug are counter-selected, while those not sensitive to the drug can still multiply freely. They are therefore the medical equivalent of “Give a man a fish”, while Checkpoint Inhibitors (CPIs) belong to the “Teach a man to fish” category. They indeed rely on a different approach: preventing abnormal cells from escaping the cytotoxic action of T-lymphocytes naturally produced by the patient. Because tumor cells are prone to mutations, they often express abnormal proteins called “neo-antigens”. These neo-antigens can be detected by the immune system as “non-self”, which activates this T-lymphocytes and triggers the killing of the tumor cell. However, some tumor cells can express ligands to receptors borne by the T-lymphocytes which deactivate these activated immune cells. Most of current CPIs treatments, whether approved or under late stage investigation, are targeting the T-lymphocyte receptors CTLA-4(ipilimumab, by BMS, tremelimumab, by AstraZeneca) or PD-1(nivolumab, by BMS, pembrolizumab, by Merck), or the tumor cell ligands of PD-1, PD-L1(atezolizumab by Roche, avelumab by Merck, durvalumab by AstraZeneca). Many of these drugs have been approved in several indications, e.g. melanoma(nivolumab, pembrolizumab, ipilimumab),non-small cell lung cancer(nivolumab, pembrolizumab, atezolizumab, durvalumab), some bladder cancers(nivolumab, pembrolizumab, atezolizumab), kidney cancer(nivolumab). Trials in many more indications are ongoing and many of these treatments are granted new approvals each year (e.g. nivolumab: melanoma in 2015, lung and kidney cancer in 2016, bladder and head and neck in 2017…). Thus, not only is their overall halo of efficacy expanding across tumors but the checkpoint inhibitor market is growing at a fast pace: from $6.1B in 2016 to more than $21B in 2021, a staggering projected growth of 28%/year over these 5 years! With existing chemotherapies or targeted therapies, to conjugate their complementary dynamics and maybe potentialize each other (e.g. current phase-3’s in first line kidney cancer: atezolizumab + bevacizumab, avelumab + axitinib, pembrolizumab + axitinib or lenvatinib, nivolumab + cabozantinib). Price is not the only potential hurdle for the wide-spread use of CPIs: as with every new class of treatment, new adverse events (AE) appear. For CPIs, AEs, albeit less frequent than with targeted therapies or chemotherapies, are less predictable and require swift managementfrom the medical team to prevent them from becoming life-threatening. This new AE profile calls for new metrics and methods for AE-management by the whole medical community, which could prevent some oncologists or even institutions to give CPIs a try. Even for the oncologists who are willing to use CPIs, biomarkers are lacking, to help determine which patient is likely to respond and which is not. Indeed, while many of the currently or soon-to-be available CPIs target the PD1-PD-L1 interaction, PD-L1 expression doesn’t appear to be a predictive biomarker, as PD-L1 expression is not always correlated with efficacy results. This can be explained by the different methodologies and cut-off used to assess this expression, the intrinsic variability of expression of PD-L1 over time and at a given time within the tumor micro environment or even the respective biology of the different cancers. Thus, among the variety of approved indications for CPIs, PD-L1 testinghas only been approved as a companion diagnostic in lung cancer and as a complementary test for melanoma and bladder cancer. However, research on that topic is ongoing and the mutational burden of cancer seems like a promising candidate for the role of predictive biomarker. The FDA recently approved pembrolizumab and nivolumab in a tumor-agnostic setting: instead of defining the eligible patients with the location of their primary tumor, the FDA granted the marketing authorization to pembrolizumab for solid tumors characterized by a high micro-satellite instability or deficient for mismatch repairfor example. 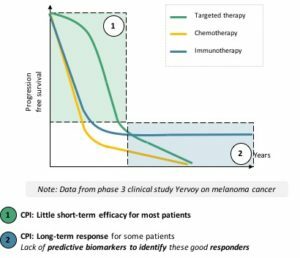 CPIs are class of treatment, with spectacular results in some tumor such as melanoma, which is bound to develop fast in the near future, at the expense of current targeted therapies. Their growth will be hindered by their high cost, especially in combinations, and less predictable adverse event profile. The length of their standard of care status in each tumor will also depend on how fast the next revolution, CAR-T, will materialize.